Ever since we first heard that the plot for Rogue One: A Star Wars Story would involve stealing the plans to the first Death Star, there has been rampant speculation about what classic characters might reappear. While most speculation focused on Darth Vader, a new report from the British tabloid The Daily Mail claims that Grand Moff Tarkin is slated to play a role in the new film. 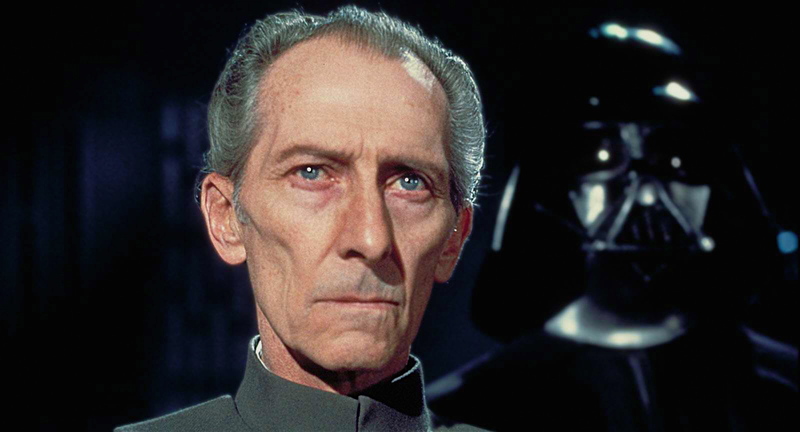 The twist, however, is that the production will reportedly use CGI to recreate the late Peter Cushing, who played Tarkin in Episode IV and passed away in 1994. But the film-makers face one particularly tough task – creating Cushing's legs and feet. When director George Lucas filmed the original Star Wars, he gave Cushing and other Galactic Imperial officers ill-fitting leather riding boots. Cushing complained so bitterly that Lucas let him wear slippers, forcing cameramen to shoot from the knees up or have him stand behind the Death Star conference table. Now, it bears keeping in mind that The Daily Mail does not have the best track record on this sort of thing (I would go as far as to say most UK tabloids are notorious for being wrong). But it does raise an interesting question about using CGI to, for lack of a better term, bring people back from the dead. Star Wars already has almost 40 years of history and with so much potential in the future, you have to wonder if it would be a possibility to do this as more and more folks from the classic films become one with the Force. On the one hand it's a great way for their characters to live on, while on the other hand it raises moral issues about putting an actor into something they didn't agree to be in (since they're dead). I'm not opposed to seeing Tarkin in the film, I'd also be intrigued to see what this technology might look like in a Star Wars film. My guess is that they probably won't be using this tech anyways, at least not for Rogue One, and that if we do see Tarkin he'll be played by someone like Wayne Pygram (who played Tarkin briefly in Revenge of the Sith) paired with a vocal performance from Stephen Stanton, who plays Tarkin on the animated series Star Wars Rebels. It would make a lot of sense for Tarkin to be in this film, even if it's just a small role. The question is, how will they go about casting him? Would you like to see Tarkin in Rogue One: A Star Wars Story? If so, how should he be portrayed? CGI? An actor in make up and prosthetic? Let us know in the comments! Because R1 is set just before episode 4. Not say 30 years before. but remember that lucasfilm has been obsessed, granted under GL's direction, with keeping continuity in character's looks. Hayden Christensen CGI face in ROTJ, Yoda getting CGI updates, even the Emperor in the hologram.